WASHINGTON (AP) — The Washington Capitals won their division again. Perhaps more importantly, they clinched it with playoff-style hockey. 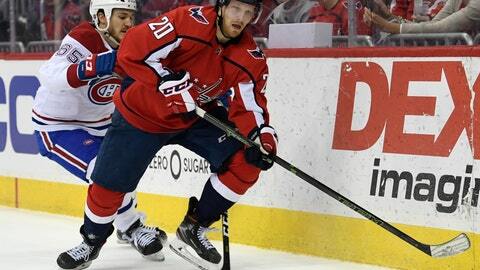 Nic Dowd put Washington ahead for good early in the second period, Braden Holtby made 33 stops and the Capitals secured their fourth straight Metropolitan Division title with a 2-1 victory over the Montreal Canadiens on Thursday night. Lars Eller also scored for the Capitals. After sealing their fifth sealing playoff appearance and 11th in 12 seasons last week, the defending Stanley Cup champions enter the postseason having won five of six. They’ve allowed only one goal in three of those victories, and on Thursday did so against a team desperate to boost its own postseason chances. Shea Weber scored for Montreal, which saw its playoff hopes dwindle with a game to go. Despite beating other division leaders in their last two games, the Canadiens entered Thursday behind Columbus for the second and final wild card due to the regulation/overtime wins tiebreaker. Even on points, the Blue Jackets now have a game in hand, while the Carolina Hurricanes clinched at least the top wild card with their win over New Jersey. Carey Price made 29 stops in the loss for Montreal, which will be eliminated if the Blue Jackets win on Friday at the New York Rangers. The Capitals’ goals resulted directly from turnovers by the Canadiens. Eller opened the scoring late in the first from from directly in front of net, after Carl Hagelin won the puck deep off a Canadiens player behind the goal line and fed Brett Connolly, who provided the final pass. Weber tied it on the power play less than a minute later, but the Dowd put the Caps in front again less than three minutes after the first intermission, this time after Andre Burakovsky forced a giveaway. For Dowd, who was not a part of the Capitals’ championship run last year, it was another important goal after also scoring the winner in their playoff-clinching win at Carolina. NOTES: The Capitals have won four consecutive division championships once before in franchise history, capturing the Southeast Division crown between the 2007-08 and 2010-11 seasons. . Weber is now one goal shy of his 100th on the power play in his career. . Washington avoided its first consecutive losses in regulation since dropping four in a row in January. . Montreal’s Phillip Danault picked up his 41st assist, moving within two of Max Domi for the team lead. Canadiens: Host Toronto on Saturday. Capitals: Host the New York Islanders on Saturday.